Check out this Portable Chargers RAVPower 22000mAh Battery Pack 5.8A Output 3-Port Power Bank (2.4A Input, Triple iSmart 2.0 USB Ports, Li-polymer Battery) External Battery Bank For Smartphones Tablets more- Black $29.98 (Retail $99.99). •Highest Output for 3 Charging Devices: 3 USB ports for a total current output of 5.8A (2.4A max per port). The Power Bank can charge two iPads and one iPhone 6s at once at their optimal charging speed with the iSmart 2.0 technology. 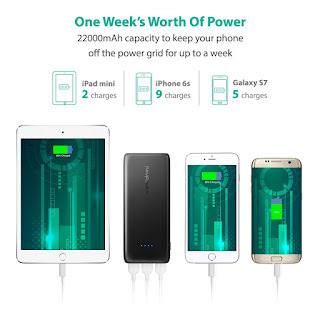 •Weeklong 22000mAh: Charge your iPhone 7 about 8 times, iPhone 7 plus over 5 times, iPhone 6s up to 9 times, a Galaxy S7 up to 5 times, or an iPad Mini more than 3 times with a massive 22000mAh capacity. Save up to 60% of charging time thanks to its 5V / 2.4A input. •Power Efficient Battery: Invest in a high-density Li-polymer external battery pack that retains 70-80% of its capacity after 500 charge cycles. It's the daily choice of Microsoft, Lenovo, Huawei, and Motorola. •New & Improved iSmart 2.0: The new and improved iSmart 2.0 adjusts current and voltage to minimize charging time. Whereas, Panasonic Smart IC frequency technology provides a safer and higher current conversion of this portable charger. •Excellent Quality In & Out: On the outside, a UL94 V-0 fire-resistant shell used by Mercedes-Benz, BMW, and others for their luxury cars. On the inside, the same battery and the same quality control as the iPhone. WHAT'S IN THE BOX: RAVPower Ace Series 22000mAh External Battery Pack, Micro-USB Charging Cables (X2), Carry Pouch, User Guide and Lifetime Warranty Card.